Have had a Rancho Safari vest for about 3 or 4 years and love it. It also has a hood. Aside from the smell (it needs a good hand washing) the only thing I don’t care about, but is almost unavoidable, is it’s a burr magnet, and briars will tear it up. I went with the vest because of string clearance. I don’t know if he still makes them, matter of fact; don’t know if he’s making anything anymore. Heard his place burnt last year during the Southern Cal wildfires. Anyone know it he rebuilt? Iron Bull - The person behind ya taking the picture have one on too? The hat (boonie) does take a little getting used to. I sewed a smallish snap to the brim just over my right eye(right hand shooter) so I can snap the brim up and out of the way. It doesn't effect the camo with a face mask on and you don't have the annoyance. My Rancho Safari works like a charm! I made mine with military sniper veil netting and various manmade camo material strips. Its light, doesn't soak up water, and doesn't effect my alergies, like burlap does. What about fire retardant? Do you need to spray these down? Where do you get it? How do you get rid of the smell? Inquiring minds want to know! I don't wear mine around a fire.....and the burlap is a natural smell.....no need to worry about that...if they smell the burlap, they done smelt you....and its YOU they don't like. zbone... I was the cameraman and yes I had on a Ghillie. We basically walked right up to that antelope single file. Didn't move when it was looking, but it really didn't do much looking. 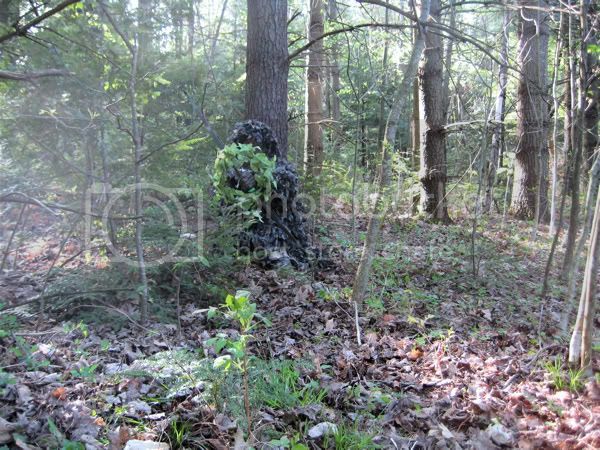 Ghillies are majic. Best camo you can use.